Rahm Emanuel, President Barack Obama’s chief of staff, traded political favours with Rod Blagojevich, the former Illinois governor, in 2006 while he was a congressman, according to leaked emails. Mr Emanuel published an endorsement of Mr Blagojevich in the Chicago Tribune in exchange for $2 million (£1.3 million) in school funding to his district, according to the emails, which were released on Monday. The newspaper had recently claimed in an editorial that Mr Blagojevich used public funds to support his re-election campaign. Mr Blagojevich, who was re-elected in 2006 but resigned in 2009, is currently on trial in Illinois on corruption charges. He is alleged to have attempted to sell Mr Obama’s former Senate seat. The emails detailing the deal, revealed by the Associated Press, apparently were exchanged between Mr Emanuel, his staff and Mr Blagojevich’s chief aide, Bradley Tusk. 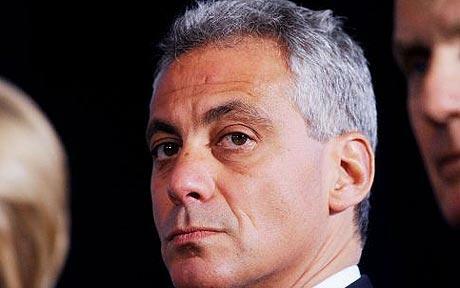 Senior Democrats have told the Telegraph that Mr Emanuel is preparing to stand down after the mid-term congressional elections in November. Funds allegedly did not arrive promptly after the letter was published, prompting Mr Emanuel to repeatedly email and telephone Mr Tusk, who then asked Mr Blagojevich why the funds had not been released. Mr Blagojevich reportedly told Mr Tusk that he wanted Mr Emanuel’s brother, a Hollywood agent, to hold a campaign fundraiser for him before he would release the grant. “I understood it to mean that the grant would not be released unless the fund-raiser was held”, Mr Tusk said on Monday during testimony. Mr Tusk said he believed doing so would be “illegal and unethical”. The fundraiser was never held, and the school grant – a small sum by state standards, according to testimony given by former Blagojevich chief of staff John Harris – was eventually awarded in small installments. Mr Emanuel represented Illinois’ 5th district in the House of Representatives from 2002 to 2008. After being re-elected in 2008, he left Congress to became President Obama’s chief of staff.